year with my parents, godmother, close family and friends. One of my favorite holidays growing up I remember it not for the presents and toys but more for the people, food, activities and memories. 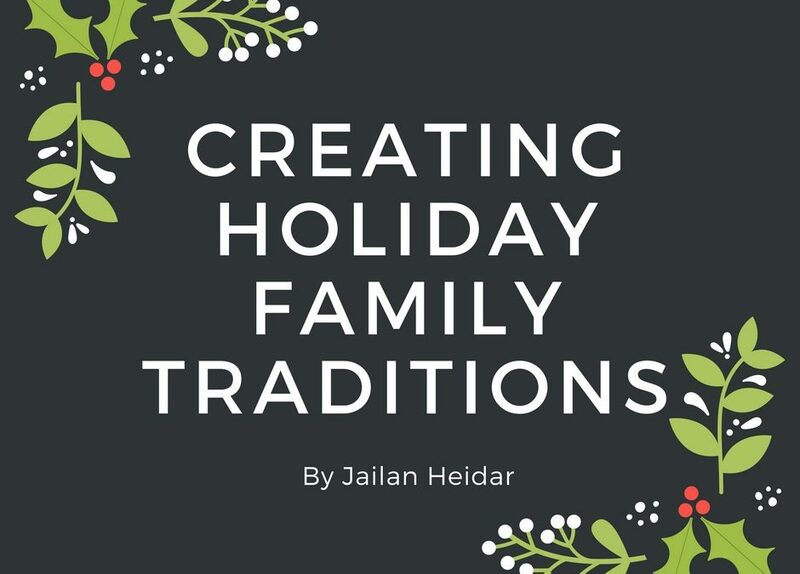 Whatever holiday or occasion you are celebrating, having family traditions is a wonderful way to create long lasting memories for yourself and children.Today, I’m sharing with you some of my fondest memories for the holidays that are in my family tradition. Food is such a big part of most cultures and definitely a huge one in Egypt. For my family our tradition was making Christmas cookies with my Godmother. As a young child my role was to meticulously decorate every gingerbread man to make each one unique! As I got older I learned so much about making other holiday dishes and brought my own twist on some. Today our family tradition in my little family is making Christmas cupcakes, also decorated with great detail. The best thing about cooking or baking is sitting at the table with everyone else and sharing. Cooking and baking are fun ways to involve your little one. Kids really enjoy decorating cookies, pie toppings or helping out with peeling onions. Any simple task can help your little one feel like they have an important role. Most of my Christmas activities were done with my godmother but I do have one special memory just for Christmas with my mom. Every year we would take the time and sit together and make stockings for every person who was joining us for Christmas dinner. We’d cut, sew and stick each one and finally fill them with all sorts of stocking goodies. Being a working mom it was a great treat to have my mom take the time and do this with me. For your family you can do any craft that you both enjoy; stockings, ornaments or cards. In the end the point is really about spending that special time together as a family. This is not a custom I grew up with but I love this idea. My brother’s family send us a family picture with their Christmas card every year. It’s a great way to update family or friends that don’t live close. For me it’s great to see how my nieces and nephew are growing and changing over the years and feeling connected as a family. Every year after Christmas my godmother takes the time to write thank-you letter to everyone. As a child I was always encouraged to join and write my own thank-yous and got my own thank-you notes stationery to help me out. This is one thing I’m still not good at but greatly cherish and value. It’s also a great way to teach children to be and show thankfulness after the holiday rush is over. Those were some of my family traditions. What are yours?